But who could have predicted back then that an online bookstore would, in two decades time, become one of the world’s most dominant online stores –– offering everything from the books they started with to the high-end fashion that resisted for so long? 20 years ago, there were a measly 40 million people using the internet in the U.S., and online sales generated only $2.4 billion. In 2017, more than 287 million people in the U.S. alone use the internet –– and online sales are expected to hit $440 billion by year end. That is an 18,650% increase in global internet usage and an 18,233% increase in online sales. Since 1997, there has been a 18,650% increase in global internet usage and an 18,233% increase in online sales. Amazon’s stock price has risen in equal measure, from $18 in 1997 to around $948 at the time of writing –– a 5,166% increase. This is no chicken and egg problem –– clearly the internet and online sales came first. But these days, it’s hard to tell whether Amazon grows larger as the internet and online sales do, or if the internet and online sales grow larger as Amazon does. Either way, the relationship is symbiotic, and though for much of Amazon’s history small business and other verticalized online sellers made an enemy of the marketplace, those tides are very quickly changing. After all, as the ecommerce industry hits one milestone after the other –– so, too, does Amazon. You might feel the quickening pace at which ecommerce adoption and innovation is hitting market. Your business may be having to turn to online for inbound sales in an industry where business has historically been conducted over the phone. Or perhaps you are now having to look to AI to implement new buyer journeys for Gen Z purchasers. Or perhaps you simply feel the pressure to give your shoppers the options for free or two-day shipping –– just to compete in today’s competitive ecommerce market. You are not wrong in that feeling. The innovative steps and measures taken today by online brands are part of an ongoing story about modern human convenience and the technology we wield to achieve it. And Amazon has been a large part of the story for 20 years. Let’s take a look. $2.4B was spent online from 40M internet users. Amazon IPOs at $18/share, valuing the company at $438M with 80K users. Amazon announces intention to move beyond books. Amazon eventually expands to 17 categories and 143 subcategories, tapping into nearly every major vertical (as of May 2017). Amazon patents 1-click checkout, helping streamline online purchasing. The patent, which differentiated the Amazon checkout experience, expires this year (2017). The dot-com bust caused nearly a thousand businesses to shut down over a 2-year period. 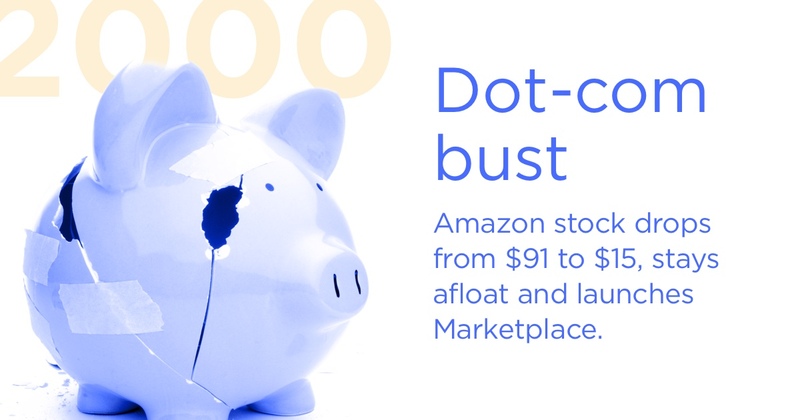 Though its stock dropped from $91 to just over $15, Amazon stayed afloat and launched Marketplace, allowing third-party sellers on the platform and expanding SKUs from 4M to 5.5M. By 2014, 2 million third-party sellers shipped a record-breaking 2 billion items. As of 2017, sellers account for 44% of all items sold on Amazon. Amazon introduces “Free Super Saver Shipping” service, which provides free shipping on orders over $99. Free shipping, offered by half of all businesses in 2015, has become a consumer expectation. First Cyber Monday occurs to push holiday shoppers online. Cyber Monday 2016 was the biggest day in the history of US ecommerce, with a total $3.45B in sales. Amazon Prime is launched, providing free shipping for 1 million items. 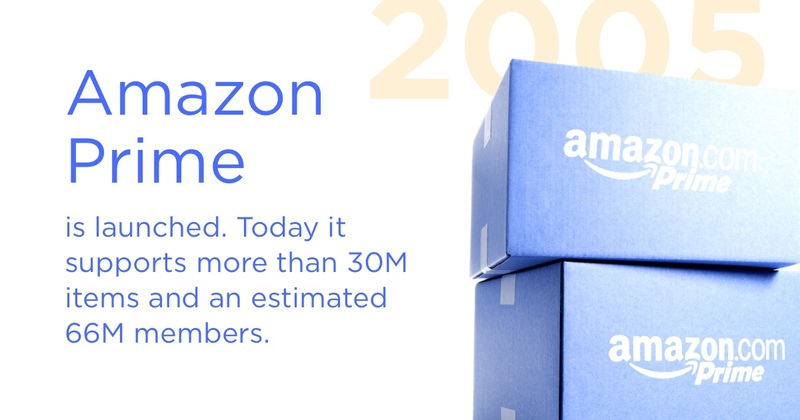 Today, Prime supports more than 30M items and an estimated 66M members. Prime inspired similar shipping programs from Walmart, Jet.com and eBay. Alibaba eventually introduced Singles Day (11.11) to drive single-day volume (like Cyber Monday). Amazon launches Fulfillment by Amazon for third-party sellers. Today, it spans over 100 countries. Apple introduces the iPhone, revolutionizing the way we interact with mobile devices. Today, 80% of online shoppers visit retail sites on mobile devices and mobile commerce is expected to top $152B by 2021. BigCommerce is founded, providing a SaaS solution for small businesses looking to launch online storefronts. Today, BigCommerce serves startups to enterprise brands making more than $100 million in annual revenue. Low cost of total ownership, easy customization and built-in marketing tools empower ecommerce brand employees and entrepreneurs to earn more sales across the web. US ecommerce sales hit $362B, 14% of all US commerce sales. Amazon is now considered the leading ecommerce company worldwide with more than 500M SKUs in the US alone, accounting for 53% of US ecommerce growth. Amazon successfully completed first drone delivery in UK. 55% of online product searches begin on Amazon. BigCommerce announced native integration with Amazon, simplifying the way that small merchants can sell through the retail giant while maintaining their own store. Ecommerce sales are predicted to grow 8–12% (between $427B–$433B) this year — 3x the broader industry growth. The UN expects online consumers to grow to 1.6B by 2018. 19% of SMBs believe Amazon will be a key revenue driver in 2017. As you can see, 2016 was a pivotal year for online brands when it came to sentiment about selling on Amazon. Now, as the world’s 5th largest company, online brands have come to understand that trying to compete with Amazon is not an effective business strategy. Instead, these brands have turned to finding ways to leverage the marketplace to their advantage –– growing sales and driving revenue through channels beyond their webstore. 20% of BigCommerce customers have connected their websites to at least one additional channel, like Amazon. Of merchants who have enabled Amazon, roughly 12% of cumulative GMV comes through Amazon. According to a recent survey of BigCommerce merchants, 73% of SMBs are considering expanding to sell on Amazon or eBay in 2017. 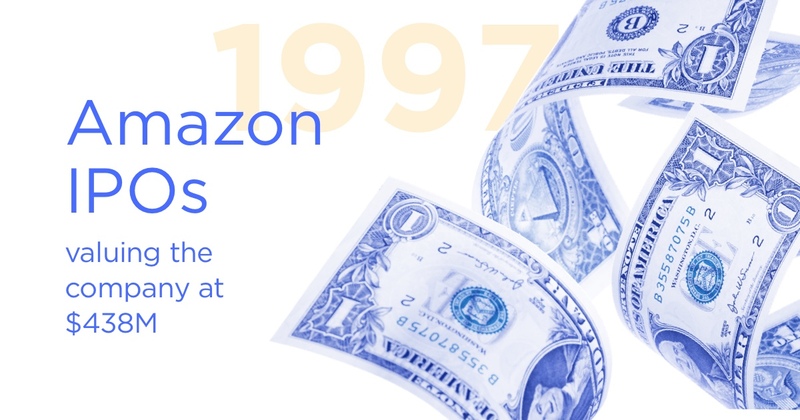 Here is what the past 20 years look like, visually, as Amazon and other online brands converge –– offering merchants additional product options, prices and convenience at every step along the way. Selling on Amazon may not be the right choice for all brands –– depending on the products you sell and the stage of growth you are in. Let’s look at a few ways to determine whether your brand is ready to sell on Amazon. According to James Thomson, Partner at the Buy Box Experts and former Head of Selling on Amazon, the products that do best on Amazon are unique items. This means goods you manufacture and sell yourself. In general, if you both make and sell your own unique products, you are a good candidate for selling and succeeding on Amazon. In this piece, James Thomson gets in-depth about who should (and more importantly, who should *not*) sell on Amazon. Measure profitability accurately: Don’t average everything out, and look only at your overall sales numbers and margins. Start thinking about every SKU you sell on Amazon as having its own P&L, its own market forces, and its own level and types of competitions. Such an approach has helped many a seller rationalize its catalog, focusing on bottom line growth ahead of all other financial goals. Look out for duplicate listings from competitors: Duplicate listings on Amazon can be an effective way for competitors to divert traffic away from your product listings back to theirs. It’s worth, at least once a quarter, to search the whole Amazon catalog for duplicate listings of your items. James Thomson is back at it again giving you all the dirty details to the most common selling on Amazon mistakes –– and how to make sure you don’t make any of them. If selling on Amazon is new for you, remember that you do not have to do all of the selling, setup or optimization by yourself. It may be worth it for your to hire a few outside and experienced sources to help you with tasks so you can focus on both your webstore and your Amazon channel growth. We’ve put together a list of more than 230 companies that do just that, and sectioned them out by the service they offer and how to know you need them. You can get the free directory, or buy it on Amazon to keep a physical copy on hand. Looking to Optimize Your Amazon SEO? You’re in luck! Use our free ASIN Lookup tool to figure out which keywords your competitors are using to rank highly on Amazon –– and then alter your strategy to boost your rankings (and your sales). Folding Chairs and Tables now sees more than 10% of their revenue coming directly from Amazon –- and they’ve only been selling on Amazon a couple months. How did they become so successful so fast? By focusing on a single product they sell nowhere else on the web. Using their BigCommerce Analytics, they were able to see which products sell the best together and offered a table + chairs listing combo on Amazon that immediately beat out other listings and drove increased sales to their brand. Now, they are exploring additional product bundle launches on Amazon –– keeping their offerings on the marketplace and on their webstore different for the various audiences that shop on either one. If your brand is a fit to sell on Amazon, start doing so now. Amazon isn’t going anywhere –– and as they expand to additional markets and continue to invest in the latest and greatest in ecommerce innovation, your brand and products will be right there along for the ride. 20 years ago, had you invested, you’d be half a million dollars richer. Don’t let the opportunity pass you by again. If you are a BigCommerce merchant, you can begin selling on Amazon right now.